Copetech-SM purchased its first Ageotec Perseo GTV in 2012, and we can proudly assert that the vehicle has already completed successful inspections in every part of the world (most of all in Chile, Guadalupe and Azerbaijan), reaching depth of around 1200m. 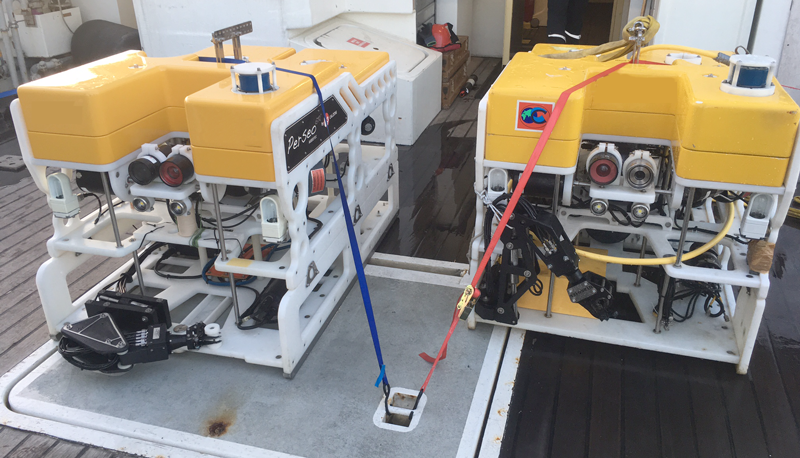 And now, thanks to the reliability and high versatility guaranteed by our Ageotec ROVs, Copetech-SM chooses to purchase another GTV. The delivery, organised in Marseille, has been followed by a testing phase of the two vehicles, which included the check of auto-depth, auto-altitude and auto-heading automation.  According to our Customer requests, the older Perseo GTV has been updated to the current firmware and hardware version, in order to guarantee the compatibility of the two underwater vehicles and the full interchangeability between them. To run the tests we used the André Malraux Research Vessel, ship owned by the DRASSM (Direction des Recherches archéologiques Subaquatiques et Sous-Marines) who reports directly to the Ministry of Culture and Communication of France, and which operates exclusively in the field of the underwater archaeological research. 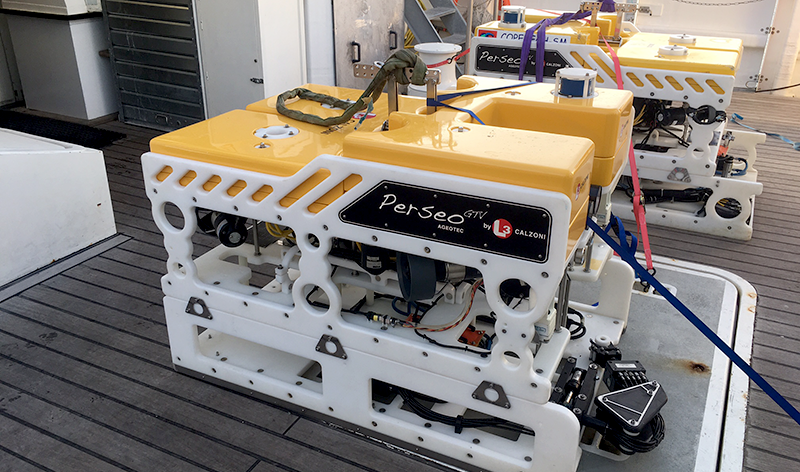 Both Perseo GTV can reach a maximum depth of 1500 m, they are equipped with a Tritech Typhoon camera (a robust, high resolution colour underwater video camera with an auto-focus zoom lens) and an Ageotec B/W camera. 6 thrusters of 1 kW each (4 horizontal and 2 vertical) provide a front thrust of 70 kg (with a maximum speed of 3 knots) and, thanks to the instrumental skid and the float additional, the payload of the vehicle can reach 40 kg. Moreover, the reliable panoramic sonar Tritech Super SeaKing allows the ROV Pilot to operate safely, constantly monitoring the surroundings, and give the possibility to connect up to two additional color camera. 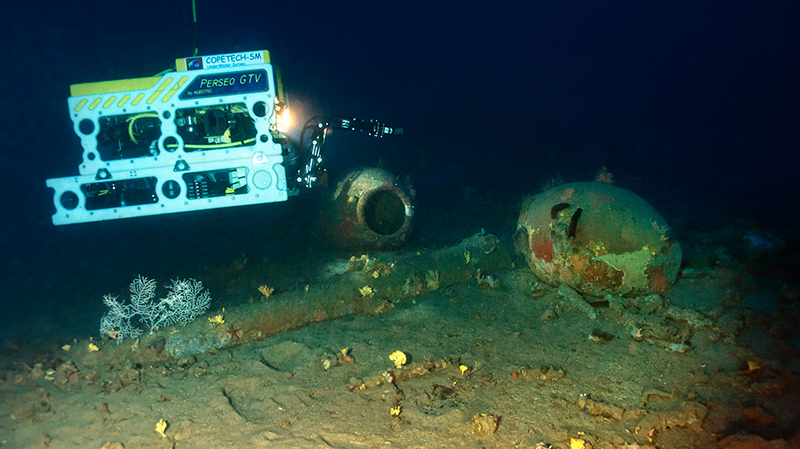 Thanks to the cooperation with Copetech-SM and reliability of our vehicles, the DRAMMS is leading successful archeological operations and classifications of wrecks as reported in December.